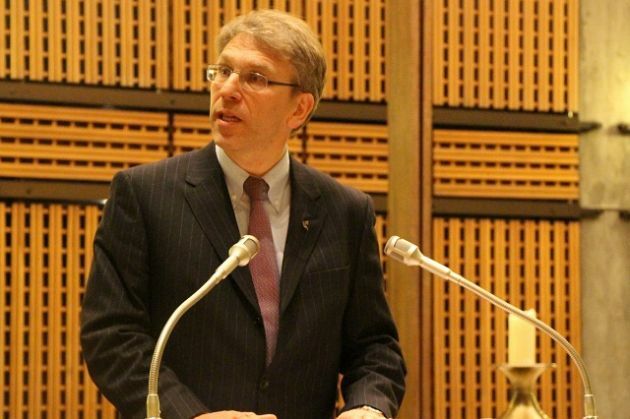 (Photo: Ecumenical News / Peter Kenny)World Council of Churches General Secretary Rev. Olav Fykse Tveit speaks at the interreligious prayer service at the Ecumenical Center in Geneva on January 21, 2013. The service was held during The Week of Prayer for Christian Unity, which is celebrated January 18-25. The general scretary of the World Council of Churches, Rev. Olav Fykse Tveit has called for an end to the rising tension in the Korean Peninsula through the countries involved engaging in an immediate dialogue on peace, reconciliation and reunification. The WCC is is scheduled to hold its 10th Assembly, when its highet governing body meets every seven years, in the South Korean city of Busan in in October. "The situation on the Korean Peninsula is of increasing concern to the WCC not only because of the impact on its member churches in South Korea, but also for the Korean Christian Federation in North Korea with which the WCC has developed long term dialogue and relationships," said Tveit in a statement Tuesday. Tveit noted the world church body that represents more than 500 million Christians worldwide has no no plans to have its meeting anywhere else but in Busan. "The theme of the assembly is 'God of life, lead us to justice and peace.' It is now that the Korean peninsula needs a message of justice and peace," said Tveit. He said that holding WCC meeting in Korea should give churches around the world the chance to express hope for reconciliation to the Korean people. "Peace on the Korean peninsula is possible without hostilities," said the WCC general secretary, a Norwegian Lutheran. This message of peace came on the same day that the U.S. commander in the Pacific called the continual violations of U.N. Security Council resolutions by North Korea a direct threat to U.S. national security. "A major conflict in Korea could have unpredictable, long-term and far reaching impacts due to the central location of the Korean peninsula in Northeast Asia and the vital importance of the Northeast Asian trade to the global economy," said Adm. Samuel J. Locklear. Locklear, the commander of the U.S. Pacific Command, made his remarks before the U.S. Senate Armed Services committee hearing Tuesday. He also said that he was confident that the U.S. would help defend its forces, as well as its international friends. "We're ready," Locklear said about the prospect of a conflict. Tensions have ratcheted up between the Korean nations and allies since North Korean Supreme Leader Kim Jong-un ordered a third nuclear weapons test in February. The action breached U.N. sanctions and ignored warnings from the communist nation's single major ally, China. Last week Jong-un declared "a state of war" on South Korea and closed the only remaining inter-Korean border zone that netted his impoverished nation $2 billion in trade a year. Earlier Tuesday, North Korea's state-run media also began running stories that have further exasperated relations. "Once a war is ignited on the peninsula, it will be an all-out war," said a representative of the North Korea Asia-Pacific Peace Committee. This falls into line with the country warning diplomats in North Korea to seek shelter if conflict begins. Tveit and the WCC have long called for a diplomatic engagement between all the parties since the international temperature began to boil in February. "The current situation demonstrates an urgent need for the members of the Six-Party Talks, the six governments most responsible for peace and human security in Northeast Asia, to return to their own earlier path of negotiations and confidence-building," Tveit said. The planned WCC assembly for later this year would be the tenth occasion that Christians from around the world would gather every seven years to celebrate spiritual diversity and the unity of Christians.